Wonderful quality set of 6 ceramic tile coasters with felt backing. 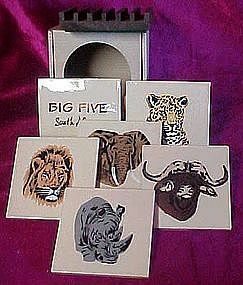 Boxed set includes various African big game safari animals such as the leopard, elephant, water buffalo, lion, & rhino. Each glazed tile measures 3 5/8" square and is 1/4" thick. Comes in the original box with a wood display to set the coasters in. Never used! !